Predator Fishing in Thailand at Bungsamran Fishing park in Bangkok for the predatory Chaophraya Catfish allows anglers to fish for yet another giant fish of Thailand capable of attaining weights approaching one hundred kgs. The Chaophraya Catfish aka Dog Eating Catfish in Thailand. The Chaophraya Catfish is another monster fish species which is indigenous to the Mekong River in Northern Thailand. The predatory Chaophraya Catfish is an endangered species in its wild and natural environment of the Mekong River basin and has been recorded at weights up to 96kgs. The giant pangasius is a benthopelagic and migratory species. Juveniles and adults feed on crustaceans and fishes. These fish typically spawn just prior to the monsoon season. The Chaophraya Catfish is a monster fish which ranks amongst the largest freshwater giants of Thailand and is a highly prized capture for specialist anglers and sport fishermen alike. The heavily built and muscular Chaophraya Catfish is similar in appearance to its cousin the Mekong Catfish but is easily distinguished by its long protruding quill like dorsal fin which breaks through the waters surface as it actively hunts prey fish in the upper layers of water. 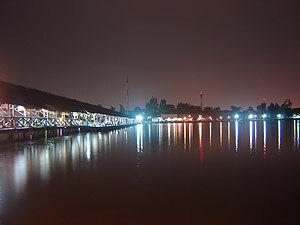 Bungsamran fishing Park opened on April 6, 1984 with a total area of 50 acres with an average water depth of 4.15 m. The world famous Bungsamran Lake in Bangkok holds a large head of big Chaophraya Catfish and is one of the best fishing locations to catch these freshwater giants of Thailand. This record breaking fishing park in Bangkok has consistently produced various monster Chaophraya Catfish over the last few years to a whopping fifty kg’s+ in weight. This fishing Lakes location seems to be one of Bangkok’s best kept secret, mostly only known to the locals. Downtown Bangkok is a maze of roads, streets & canals networking amongst the diversity of modern offices, wooden houses, ancient temples, markets, street vendors, Thai communities and so much more. Predator fishing anglers fishing for Chaophraya Catfish at Bungsamran Lake in Bangkok will be pleased to find a mature twenty acre lake hidden away amongst the suburban back streets of Bangkok. This venue is an established commercial fishery which has probably the highest stocking of monster fish in a lake anywhere in the world! The lake is dissected by a wooden stilted fishing platform allowing predator anglers to access both sides of the lake. Previously when predator fishing for Chaophraya Catfish in Bangkok we used small Tilapia livebaits but due to a recent ban on live baiting (except when Arapaima fishing) our chosen bait for the Chaophraya Catfish is battered fish balls which are purchased from local food cart vendors at the lake. Predator fishing for Chaophraya Catfish at Bungsamran in Bangkok sees anglers using relatively simple and basic predator rigs incorporating floating bungs coupled with strong fluorocarbon hook lengths and super sharp Owner hooks. Baits are fished in the upper layers of the lake in an attempt to intercept the numerous predatory Chaophraya Catfish which regularly patrol the surface layers actively hunting prey fish. Battles with this awesome monster catfish species can last for up to an hour with the powerful Chaophraya Catfish fighting every inch of the way to the net! The Chaophraya Catfish is a highly evolved and extremely adept predatory monster fish which is highly catchable using the correct predator fishing techniques. The Chaophraya Catfish in Bangkok are best approached in the mornings and evenings when they ravenously hunt prey fish in the upper layers and can be easily intercepted with float fished baits. When predator fishing at this venue it is advisable to fish in the early part of the day for the Chaophraya Catfish before switching over to conventional Mekong Catfish or Giant Carp tactics for a few hours during the hottest part of the day. 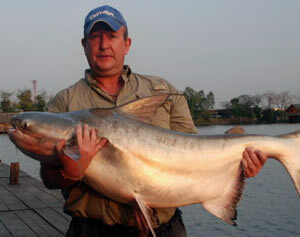 The daily itinerary for our Chaophraya Catfish predator fishing trips at Bungsamran Lake in Thailand is listed below. Daily Predator fishing at Bungsamran Lake in Bangkok itinerary. Predator anglers wishing to target the Chaophraya Catfish present in Bungsamlan will be picked up from your Bangkok hotel by a Fishsiam representative and transported to Bungsamlan via air-conditioned minibus. On arrival the angler(s) will be equipped with the necessary equipment (one rod and reel) and terminal tackle in addition you will be supplied with livebaits where appropriate or other baits. Angling with one rod on livebait setup from the public area more commonly known as the shed it is advisable to adopt a mobile approach in order to target these impressive predatory catfish. With the optimum feeding times for the capture of Chaophraya catfish being in the morning and evening and with the hottest part of the day around noon being totally unproductive for this particular species. 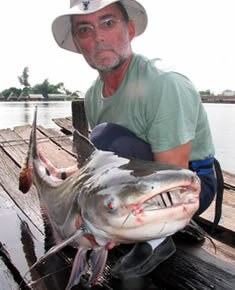 It is suggested that at this period of the day the angler(s) target the Mekong Catfish with sliding float setups. All bait and tackle will be supplied by your personal angling guide in addition to full assistance with any other angling requirements. The duration of our daily Chaophraya Catfish expeditions to this exciting venue last eight hours after which the angler(s) will be transported back to their Bangkok hotel via air-conditioned vehicle. 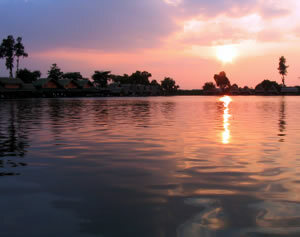 Fishsiam offers daily predator trips to Bungsamran Lake in addition to weekly holidays. Bungsamran Lake can also be combined in our tailor made packages which are designed to meet the specific requirements of the visiting angler. Please note that our Bungsamran Lake predator fishing packages now only allow for fishing with one rod due to recent price increases by the lakes owner (see below). An additional rod can be added at the increased price of 2500 baht per rod. The price for our Chaophraya Catfish fishing package is now 7500 baht per day and can be shared by 1-3 anglers. This fishing tour is available to anglers from Pattaya, Hua Hin and Cha Am subject to additional charge for transport. Please note that due to recent changes introduced at Bungsamran Lake by the owner have caused us to temporarily cancel this fishing tour. Contact us for information about our other Bangkok fishing tours. Make your booking or enquire for further details.